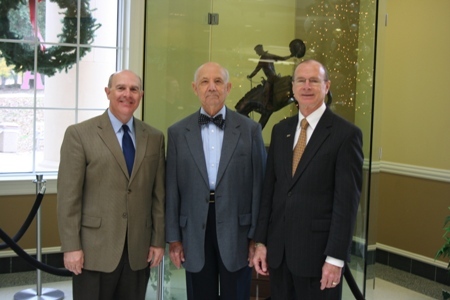 John Ragsdale, center, stands with Dr. Trey Berry, dean of the College of Liberal and Performing Arts, and SAU President Dr. David Rankin after presenting the University with a check to begin the John G. and Dora J. Ragsdale Endowed Chair of Arkansas Studies. This is the first such chair in the state. Endowed chairs generally provide additional funds for a salary supplement and research opportunities for faculty members. John Ragsdale is known throughout Arkansas as one of the greatest promoters of Arkansas history and will soon be honored for that legacy at Southern Arkansas University. The Southern Arkansas University Foundation is raising funds to complete the John G. and Dora J. Ragsdale Endowed Chair of Arkansas Studies. The endowed chair will be the first of its kind in Arkansas. “It shows that we recognize the importance of the history of our state,” said Dr. Trey Berry, dean of the College of Liberal and Performing Arts. “An endowed chair is something to honor a distinguished professor whose scholarship in teaching can be recognized,” explained Berry. “It also allows the professor independent research and travel funds.” Berry said endowed chairs help the University in the budgeting process and add prestige when recruiting new faculty members. Berry said he plans to pursue opportunities to add additional endowments throughout the College of Liberal and Performing Arts. Ragsdale was the “perfect fit” for this first endowment, Berry said. Not only is John Ragsdale a long-time supporter of Arkansas history, but he is also a native of south Arkansas, formerly residing in El Dorado.